The aerospace industry is the greatest consumer of Hexcel prepregs, for civil aircraft, military jets, helicopters, aero-engines or space satellite and launchers. Hexcel’s range of resin formulations for aerospace prepregs includes a wide range of epoxies for highly loaded parts and supreme toughness; BMI systems for high temperature performance; phenolics for fire, smoke and toxicity performance in aircraft interiors; and cyanate esters for space structures and satellite applications. HexPly® prepregs are available with HexForce® woven and multiaxial reinforcements, or as unidirectional tapes in various forms. Hexcel was awarded the contract to supply prepreg for all primary structures on the Airbus A350 XWB, including the fuselage. 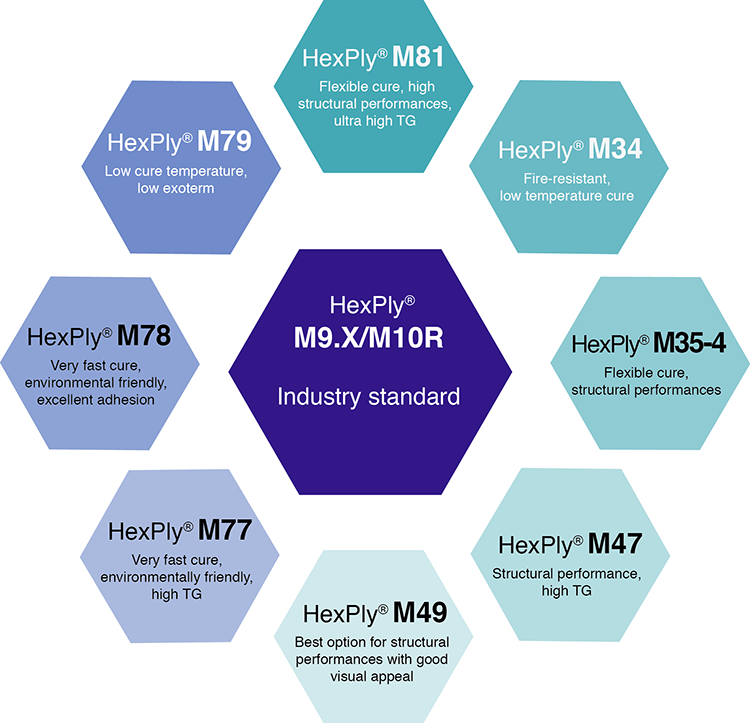 Hexcel provides a range of prepregs under the HexPly® trademark for industrial applications, using specially formulated epoxy, phenolic and BMI resin matrix systems. HexPly® prepregs are reinforced with woven, multiaxial and unidirectional (UD) carbon and glass fibers. HexPly® prepregs are used in a wide range of industrial markets and tailored to meet the specific performance requirements – whether they are low temperature cure and good fatigue performance (HexPly® M10R); Fire, Smoke and Toxicity performance (HexPly® M34); a great visual finish (HexPly® M49) combined with high temperature resistance (HexPly® M47) – see chart below for an overview of the range. The HexPly® Industrial product range continues to evolve, with surface films, systems with very short cure cycles and higher temperature performance resins being introduced. All industrial markets can benefit from Hexcel’s high performance lightweight composite materials, from traditional markets such as sports equipment to new applications such as industrial machinery and alternative energy. Visit the App Store to download our Prepreg Resin Selector App that will guide you to the best prepreg for your application and includes data sheets.